WE HAVE A NEW MINISTER! On June 11, 2017, our congregation overwhelmingly voted to call Oscar Sinclair as their next settled minister. To our great delight, he responded with an equally enthusiastic, affirmative response. He and his wife Stacie will start relocating to Lincoln this summer and Oscar will begin his official duties on August 1. Our congregation is excited about the future we can build with our new minister. Oscar Sinclair grew up in East Lansing, Michigan and is a former community organizer who served in Lesotho in the Peace Corps. He and his wife Stacie currently live in New York where Oscar is a student minister at the Shelter Rock UU congregation. Stacie is a social worker specializing in health care public policy. They say they’re looking forward to buying a dog and a house with a porch so they can truly be part of a neighborhood. At one of the speeches at his wedding, one of his buddies said Oscar’s the kind of guy you can sit down with and be talking in minutes about the most important things in life. It’s a revolutionary act for people to meet one another and gain the power to act. He thinks Lincoln UU has the people most ready to move. He has the capacity to lead in such a situation. He went to Wesley Methodist in part to perfect his relationships with other religions. He takes advice and reaches out for advice when he needs it. He’s a good well-rounded UU thinker. If I had the chance to hire him I’d do it in a minute. Our congregation loves him. When they hear he’s going at end of June, they ask if we can keep him. His scholarship is impressive. When I saw that he had gone to a Christian seminary, I thought that would shape what he does and he wouldn’t have as complete UU background as those who went to UU seminary. Quickly found out that wasn’t true at all. If you want a dictator, you don’t want Oscar. He would be very uncomfortable with that role. He was one of our representatives in a delegation when police in NYC were infiltrating mosques. He was very well received and they liked him. In a very civil way, Oscar was able to make powers-that-be aware of situation. Wonderful at reaching out to those who don’t look like him. Really listened before jumping in. We were both at a Methodist seminary but neither of us were a Methodist, so we found each other. I found him to be incredibly warm and kind person. He restored my faith in heterosexual white men. He’s not limited to one leadership style, which makes him revolutionary. He’s not limited to one world view: he’s one of the most true Unitarians I’ve ever met. That comes through in how he is as a human: good leaders lead by example and he does that, embodying that completely. He is ready to lead not just the cong but also the community. His most significant asset to a new congregation? Himself. He is genuinely and honestly himself. He leads by example. He is the things we profess we need to be. As you can see from the poster in the Gathering Space, we have moved steadily along our path. The Negotiation Team (consisting of MSC committee member Trish Lanning, board of trustees member Kristi Wamstead Evans and trusted church elder Charlie Huber) has completed the proposed contract. The contract and all other materials have been submitted to the UUA. With the launch of the website, the search is now in earnest as we await ministers telling us they’d like to be considered. The committee has been developing interview questions for candidates as well as probing inquiries for the candidates’ references. We will interivew both primary and secondary references and we will have access to the UUA complete file on candidates to examine any past concerns or noteworthy accomplishments. This interview and vetting process will continue through March. Our goal is to announce our selection in April, have the finalist present a sermon in May or June, and the new minister to assume his or her position in August. The next step to attract ministerial candidates is officially submitted. We’ve sent in our Congregational Record (“CR”) to the Unitarian Universalist Association and now ministers in search know we’re looking. The CR document took a lot of homework, and many of you were generous with your time to help us dig out statistics and historical facts. The CR describes our congregation, the city of Lincoln, and tries to capture the sort of minister we’re looking for. The ministerial and congregational profiles can be viewed here. We’ll also make paper copies for folks who prefer that format. Look at the table under our Ministerial Search Process poster in the Gathering Space for a copy. We understand there will be dozens of ministers in search—and dozens of other congregations trying to attract the best. Now the committee turns to finishing the second significant piece of the work—our “packet.” While the CR is a shorter document that is really “just the facts, ma’am,” the packet will be a website with lots more in depth information, photos, and even a video to show off our beautiful church. Julie has been the primary creative genius behind the website—and since you know how good she is at both documentary and artistic work, you know it’s going to be great. Soon, the committee will start receiving actual resumes from ministers with an interest in us. Remember the dating analogy? If seeking a minister is like dating, then this is the night before Prom and we are hoping someone asks us to dance. We’re petrified and excited and hopeful. Let us know if you have questions about how things are going. You can always email the committee at search@unitarianlincoln.org. Progress! Have you looked at our Ministerial Search Process Path poster in the Gathering Space recently? We’re trucking along quite nicely—just look at all those check marks! Recall the comparison between this process and creating a singles ad? Well, we’re just about to press “send” on the basics of our singles ad. Instead of our height, our weight and our eye color, we’ll be uploading our Congregational Record with a lot of nitty gritty concrete information about our congregation. It is the first time ministers in search will officially know that we’re single and available to be asked to the dance, and it will go live no later than October 31. We still have to finish the more creative and interesting part of the ad—the “Information Packet.” The Packet is comparable to your personal essay describing how much you like long walks on the beach. That work is being finalized over the next month or so. The update from the Ministerial Search Committee is just two words: THANK YOU. THANK YOU to those who completed the survey, bringing us up to a respectable response rate of 85%. That will definitely show interested minister candidates we’ve got an engaged congregation. THANK YOU to those who attended the Beyond Categorical Thinking workshop, sermon or post-service talk by Rev. Keith Kron from the UUA Transitions Office. Your thoughtful participation raised awareness and demonstrated a commitment to our equal opportunity policies. THANK YOU to every participant in the Focus Groups. Some of you gave up your regular Open Circle meetings to do this important work while some of you came in for an extra hour to share your perspectives. These deeper conversations are now being compiled for the whole committee’s review and reflection. THANK YOU to those who have prepared meals for the committee. Your kindness permits us to race from our work-a-day responsibilities to our weekly marathon meetings without worrying about low blood sugar. THANK YOU for the kind and supportive words as we enter the final stretch of research and writing. The “singles ad” describing our church is our main task between now and Halloween, and we’ll share more when it’s up and attracting inquiries. Results from the congregational survey are now up on the website: http://www.unitarianlincoln.org/survey.html It’s a fascinating snapshot of who we are and who we want to be. We hope you’ll check it out. A hard copy will also be available at the church office. We met our response rate goal of 85%--thank you all for taking the time to participat. This information will be available to minister candidates currently in search as the committee finishes preparing our submission to candidates. As always, contact the committee with any questions or concerns by email at: search@unitarianlincoln.org. If you missed the last presentation, this is your chance to have an overview of our timeline and process. Even if you made it last time, we will have new goodies to unveil - a very preliminary report on the congregational survey responses as well as a robust Q&A about the search. ZOICKS! EEEK! YIPES! The Ministerial Search Committee has realized we’ve almost met our survey completion goal…almost, but not quite. We need the last stragglers to fill out their surveys. You know who you are: there is no shame asking for another copy to be sent by paper or email—but there is shame if your voice is left out of the conversation. Last push, folks—go go go! Contact the committee right away for a new copy: search@unitarianlincoln.org. Our next MSC presentation will be held immediately following the service on Sunday, September 11. If you missed the last presentation, this is your chance to have an overview of our timeline and process. Even if you made it last time, we will have new goodies to unveil - a very preliminary report on the congregational survey responses as well as a robust Q&A about the search. Congregational survey deadline has been extended to August 1. We’ve had a lot of surveys completed, but not everyone has done theirs yet--we’d hate for your voice to be left out. Please contact the Ministerial Search Committee if you need an electronic or paper copy of the survey by emailing search@unitarianlincoln.org or contacting the church office. Data analysis begins immediately and we’ll announce a meeting date soon where we’ll share the survey results. At the next meeting, we’ll also recap the search process for those who missed the last presentation. Remember: we’re aiming for a high response rate to impress minister candidates with our church’s level of engagement, so fill out your survey now! The congregational survey went out this weekend. We need you to fill it out because while we are looking for a minister, ministers are also checking out churches. In essence, we’re composing our “singles ad” for the church with information from the survey. The survey asks you about who you are so we can paint a picture of our congregants for ministers to get to know us. The survey also asks you what you’re looking for in your church life and your future minister so the committee can find the best minister match. Our national organization tells us that as ministers look at churches, they look hard at how many of the congregation participated in the survey. A low survey response rate sends the message that we’re not engaged and enthusiastic. This is why having your voice added to the survey will put us in the best position to attract a minister by putting us in our best light. So please: fill out that survey by July 24! If the church office has your email, then you’ve received a link to the online survey. (Check your spam file too--they might end up there.) If we didn’t have your email address, we are putting a paper copy in the mail to you instead. Want to get the online version? Email the committee at search@unitarianlincoln.org and we’ll get you a link. Need a paper copy? There is a stack awaiting you in the church near the search process poster. Gretchen generously gave all the Ministerial Search Committee (MSC) members a copy of the book “Like Dating, Only Worse: Rethinking the Ministerial Search Process.” So far, we’ve held a weekend retreat and met weekly to do the work of finding our settled minister—and we haven’t run into that “worse” part yet. Our first big labor is nearly ready to share with you—a churchwide survey. We want to capture information that will give ministerial candidates a sense about who we are—and we need to know what you want in a minister. We are hoping for a 100% response rate, and we’re going to make the survey as accessible as possible. We’ll have an online Survey Monkey version for people who are traveling or away from the church, but we’ll also have paper versions for people who don’t use computers. Your input is essential, so please help us by completing your survey. The MSC will continue to meet weekly as we plan for more shared communication (including small group cottage meetings), engage in learning more from the Unitarian Universalist Association, and write our "singles ad" for ministers to review and learn about our church. The book “Like Dating, Only Worse” says “Search committees are not in the hiring business. They are in the church transformation business.” We know how important this is, and we can’t do it without you. Thank you for entrusting us with this work. Your Ministerial Search Committee is nose to the grindstone! We are meeting weekly and our first priority is to present you all with a survey. We need EVERYONE to fill it out—otherwise how will we know what you want? Look for more information soon. I was dragged to this church by a significant other in 2007, eventually signed the book in 2009, and I haven’t been able to stop coming since. Through the UCL, I’ve found close friends, spiritual growth, and some moderate people skills. I’ve been involved at various times with the Newcomer Committee, the Worship Associates, the Transition Team, the Young Adult Open Circle, and RGL. ​At first I was hesitant about the time commitment of the Search Committee, but after thinking it over (and getting my partner’s forgiveness in advance) I’ve realized I can’t turn down the opportunity: This church has been a warm, enriching, powerful place for me, and this work will help it be same for so many more in Nebraska for decades to come. And in any case, I can’t imagine a better group of people to work overlong hours with! My most recent involvement at the church has includes eleven years as Worship Arts Director and design work on the website and newsletter. Our church brings a unique perspective to the Lincoln religious landscape and I have appreciated being part of a loving community where atypical thoughts and questions are honored. I believe our congregation is poised to be a powerful presence beyond our walls and I am eager to help find the minister who will guide us in that mission. I’m hopeful that my time as a staff member and my interactions with other congregations across the country will provide a useful lens with which to evaluate our ministerial candidates. In addition, I hope I would be able to share technological and design skills (and hundreds of photos!) which would allow us to depict our church joyously and accurately in the information which will be provided to interested ministers. The Unitarian Church of Lincoln has been my religious home since 1980. At first I just attended service but then got involved with the Religious Growth and Learning Program, which not only made me more connected but also educated me about what being Unitarian meant. I became an official member in 1989. Since that time I was married and raised to children in the church. I have enjoyed getting involved by chairing the RGL Committee, teaching, serving a term on the Board and Management Team, and being a member of the Personnel, Nomination and Auction Committees. 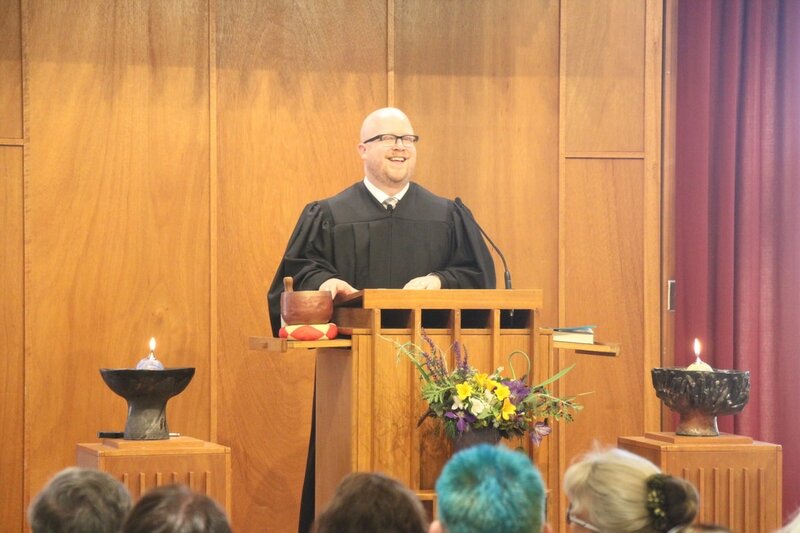 I also enjoy doing pulpit decoration, ushering, grounds and building cleanups and singing in choir. What have proven meaningful to me are our principles, and the great friendships I have formed. In serving on the search committee I am committed to doing my best to listen to all perspectives, use any resource from the UUA that we can and to find a minister that will help us move forward in the future. The gifts I will bring to the committee is organization, church experience and knowledge, and the need to complete whatever task is given me to the best of my ability. The vast majority of my involvement, and the meaningfulness of this church in our lives occurs on behalf, and along side, of children and families. I can sum that up with just a few words: RGL and everything that matters to RGL. It has been my pleasure to serve this church with integrity, for more than a decade, with supporting teachers in RGL and OWL, working with church staff as we seek and support RGL personnel, and loving the children as they learn and connect with adults in this congregation. I have been a member of the church since 2001. It’s been my safe haven to find like minded people who insist upon social justice for all. Over the years, I have volunteered in various ways, including a term on the Board, current service with the Lincoln Unitarian Foundation, work with the Worship Associates, two years teaching middle school for RGL, and periodic turns at the coffee urn. I’m willing to serve on the Ministerial Search Committee because I can bring my experience in hiring at both my own non-profit employer and other organizations where I have served on the board. I look forward to helping us find the best settled minister we can. With all modesty, we’re fabulous and we need a vibrant leader who can help us spread the word of our fabulousness with the larger Lincoln community. As a Head Start preschool teacher, I work with children and their families who are low income, immigrants, or have special needs. We focus on engaging children with nature. I am married to Christy Abraham, with three children. Since 2000, I have been active in our peace, civil liberties and social justice work. I have served as the Education and Membership Coordinator, Treasurer, President of the Board of Trustees and as a Fair Witness. This community challenges me to be my best self. Ours is a forward-looking congregation overflowing with positive energy whose members feel on the cusp of doing something great. Let’s find the right leader to help us fulfill the amazing potential of our Shared Ministry. I asked my wife what she suggests I put down. I was hoping she’d say, “Your sense of humor and that you don’t take yourself too seriously,” but instead she offered, “You’re thoughtful and fair.” So I guess I’ll go with that. In my 32 years as a member, I've been involved in many areas of church life. Most recently, I have served as a teacher in our Religious Growth and Learning program and as a leader for Youth in Action. I have also served coffee on numerous occasions. I attended the 2007 General Assembly in Portland and was a founding member of the Grace committee which focused on anti-racism work in the region.